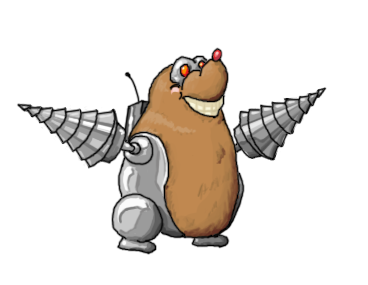 Reconstructed Mole. This one was fun to do as well. Two for the price of one. Angela had commented on my Hostile Elder Oak picture and said that it looked like Bill Cosby. I couldn't just let such an idea go to waste, now could I? I swear that some of these joke pictures are the most fun to do. The one on the left was done AFTER the one on the right, by which time I'd learned a bit about how to make it look better. Special thanks to Angela for *ahem* planting the seeds for the idea. Tried to visualize the Enraged Fire Plug spraying water, and this is what I came up with. To commemorate the wrap-up of Zargata's excellent "Fishing for Kraken" comic series (http://starmen.net/comics/series/fishkraken/), it's my rendition of lead character of the series: the Kraken-ist.